To be able to adjust our starting water to our target numbers, we need to know how much of these five minerals that we care about in brewing (Ca, Mg, Na, Cl, and SO4) exist in the water naturally. Our starting water levels have to be equal to or lower than our targets as you can always increase minerals by adding salts but cannot easily take them away. Other than pure reverse osmosis (RO) or distilled water, most water will have mineral levels higher than zero. We use our city's water for brewing as it is very soft (low in minerals). If your city water is soft and tastes fine then using cold tap water is perfectly adequate and is definitely the easiest solution for most people. For now, assume you will be using your tap water. We'll confirm in this step if your water will work for the flavour profile you picked previously. Most municipalities publish their numbers online or can provide them over the phone. Our city (Ottawa, Ontario) publishes a yearly report that contains all of the information we need (see our city's 2015 water report, excerpt below). Water reports tend to focus on the quality of drinking water so you'll need to wade through lots of information that isn't overly useful to brewers. Note: Water reports will express levels as either ppm or mg/L (they are the same thing). Comparing the two, we see that our city water is below our targets for all minerals so brewing with our city water should not be a problem. Remember that you can always add minerals in the form of brewing salts but cannot easily take them away. Keep in mind too that mineral levels can vary throughout the year, more so in some locations than others. Our city's published numbers are averages taken over the entire year. Given that these averages are very low they likely do not vary much throughout the year, so we use them 'as is' all year. Over the last 5 years our city's averages have not varied more than a point or two. If your numbers are considerably higher than ours, you may want to ask your municipality how the levels tend to vary over the year. My municipality can't provide me my water mineral numbers / I'm on a well. If the water mineral numbers are not readily available to you (such as when the water is sourced from a private well), Ward Laboratories offers their W-5A Brewer's Water Test Kit. You send them a sample, they analyze, and then email you the results. Prefer to do it yourself? Both Industrial Test Systems and Lamotte make test kits suitable for brewing. Useful if you wish to perform multiple tests or share the cost with your brew club. My water report has Sulphate as SO4-S instead of SO4. Is that the same thing? Nope. You probably received a water report from Ward Labs who reports Sulphate as SO4-S instead of of SO4. To convert to SO4 you need to multiply by 3. For example, if your water report indicates that you have 6 ppm of SO4-S, you have 18 ppm of SO4. Some of my water mineral numbers are higher than the targets! If some of your mineral levels are higher than the targets, blend your water with reverse osmosis (RO) or distilled water which is mineral free until all of the levels are at least equal to or below the targets. For example, blending with equal amount of RO water would reduce all mineral levels to half the original values. If your water is very hard (high in mineral content) as is often the case with well water, you may find it easier to start with 100% RO or distilled water and "build up" the water using salts to hit the appropriate targets. When starting with RO or distilled water assume all of the starting numbers are zero. 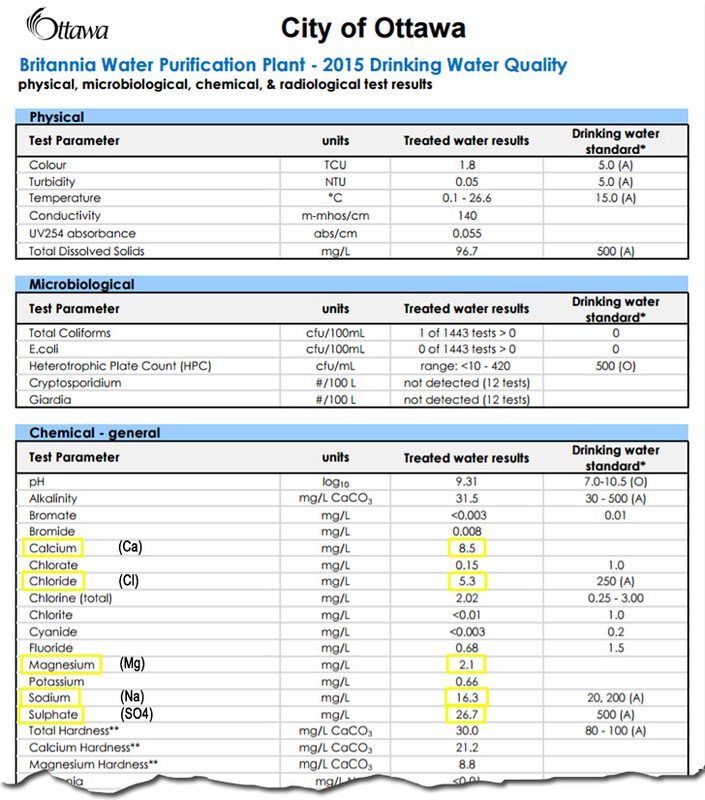 What about all the other minerals/compounds/contaminants in my water report? The five minerals that create the flavour profile we care about in brewing are Ca, Mg, Na, Cl, and SO4. Most other minerals and compounds and most definitely all contaminants should be close to zero if the water is to be used for brewing (let alone drinking). The following substances should be as close to zero as possible in water used for brewing: Aluminum, Arsenic, Barium, Bromate/Bromide, Cadmium, Chlorine/Chloramine (more on this in a later section), Chromium, Coliform Bacteria, Copper, Cyanide, Fluoride, Total Haloacetic Acids (HAA5), Iron, Lead, Manganese, Mercury, Phosphate, Tetrochloroethylene (PCE), Total Trihalomethanes (TTHM), and Trichloroethylene (TCE). The good news is that if your brewing water comes from the tap you generally do not need to worry about these levels as standards such as the US Safe Drinking Water Act and the European Drinking Water Directive legally require that these levels be kept close to zero. The substances for which slightly higher levels are acceptable for brewing include: Nitrate (<44 ppm), Nitrite (<3 ppm), Potassium (<10 ppm), and Silica (<25 ppm). Most municipalities will, however, attempt to keep even these substances close to zero (a good thing). 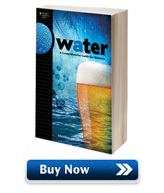 For more information see chapter 3 of the book Water: A Comprehensive Guide for Brewers where each of the substances is explained in detail. Can I use water from a water softener for brewing? Maybe. Do not confuse soft water with water that's been passed through a water softener. They are not the same thing. Soft water is simply a term to describe water that is low in minerals. A water softener on the other hand replaces minerals like calcium and magnesium that we want in our beer (to varying degrees) with sodium which we want to limit in our beer as lower concentrations tend to produce a cleaner flavour. Too much sodium may result in an unpleasant metallic/bitter aftertaste. We do not recommend using water that's been through a water softener to brew beer, especially if your untreated water is very hard. The harder the water, the more sodium that is required to treat the water, the more sodium that ends up in your beer. If you choose to use water that's been passed through a water softener, we recommend having it analyzed so that the sodium level can be determined. This should be done every time the water softener is adjusted. Can I use bottled water / spring water for brewing? Yes. Any water that is suitable for drinking can be used for brewing. However, spring water may have mineral levels that are too high to use depending on the flavour profile you are targeting. Check the label for a breakdown of the five minerals we care about (Ca, Mg, Na, Cl, and SO4) or contact the bottling company for details, and then compare with the flavour profile you are targeting. Keep in mind that using spring water will not automatically make your beer better. There is nothing special about spring water regardless of what some of the 'rocky mountain' macro brewers want you to believe. Can I use reverse osmosis (RO) / distilled water for brewing? Yes. When starting with RO or distilled water assume all of the starting mineral numbers are zero. Many brewers who only have high mineral content water available to them will resort to using RO or distilled water and "build up" to hit the appropriate mineral targets. If using a reverse osmosis system to create your own RO water make sure to follow the manufacturer's recommendations for changing the filter membranes as over time they become less effective. A total dissolved solids (TDS) meter is a handy way to understand how well an RO system is working as it (mostly) measures the amount of minerals in the water. Over time the TDS level will start to climb indicating that it's time to change the membranes. Is it ok to use hot tap water for brewing? Some brewers choose to brew with hot tap water to reduce the heating time required. While an on-demand water heater or a newer hot water tank may be fine, older tanks that have not been properly maintained may introduce a 'minerally' taste to the water due to corrosion of galvanized plumbing which can accumulate in the hot water tank. In some cases there may also be higher levels of lead in the water too. We recommend that you follow the advice of the EPA who suggest that hot tap water not be used for cooking or drinking - brewing is both! If you use tap water to brew, it's best to use cold tap water that comes straight from the water supply.